With a storyboard format and full-color illustrations, Phlebotomy: Worktext and Procedures Manual describes all aspects of phlebotomy, with complete coverage of equipment, safety procedures, arterial blood gases, point-of-care testing, and practical phlebotomy skills. Procedures are outlined in a detailed storyboard format, pairing steps with full-color photos to help you understand the equipment and techniques such as venipuncture, dermal puncture, arterial blood collection, and special procedures. 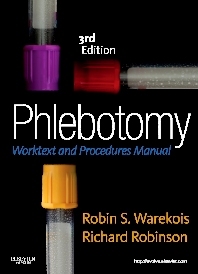 Written by Robin Warekois and Richard Robinson, this book also includes workbook sections for review, study questions, competency checklists, and a mock certification exam providing effective preparation for the phlebotomy certification exam. A storyboard format outlines common procedures, with steps accompanied by full-color photos. The Human Anatomy and Physiology section offers in-depth information on body systems. A perforated bookmark on the back cover serves as a "tube guide" or quick reminder of which stopper tops to use for various diagnostic tests. Learning objectives begin each chapter and indicate what you should achieve. Key Terms are listed at the beginning of each chapter and are bolded in the text. Lists of abbreviations at the beginning of each chapter provide a quick reference and explanation for unfamiliar abbreviations. Clinical Tips provide important hints and information. Special icons identify OSHA standards that must be followed when performing procedures. Flashbacks and Flashforwards refer to other information that can help you work safely and efficiently. Competency Checklists contain the most critical and important steps in procedures. Review questions in each chapter help you learn and remember material. A mock certification exam helps in reviewing for the phlebotomy certification exam with 200 multiple-choice questions. A glossary provides definitions of important terms identified in the Key Terms lists at the beginning of each chapter.